Because with every fall comes a new pot pie recipe! It just wouldn’t be fall otherwise. Pot pies are kind of like chili in that way, both are quintessential fall dinners, and since I already made chili, it’s time for pot pies! I decided to make autumn inspired pot pies, because you know me, I can’t help but spruce up the classics just a bit. I mean, it’s what I do. 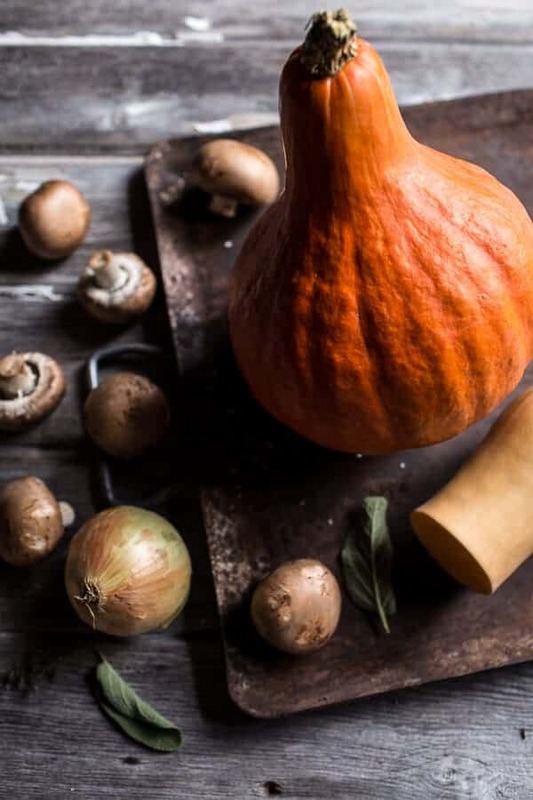 Plus I am full on obsessed with autumn ingredients right now. But I’m thinking you guys have probably realized this already. Serious talk now though. I woke up on Monday to snow on the mountain tops and beyond frigid temperatures. I wore TWO sweatshirts all day long because my kitchen was FREEZING and I just couldn’t handle it. I also allowed Asher to totally skip school for no other reason than that we were both cold and wanted to bake together all day. I had Halloween goodies to make and clearly I NEEDED little sister’s help. Since I was still watching her and the parents were off in the hot state of Florida soaking up the sunshine….and the drinks, I made the call. We just needed more sister time, and since it was our last day together (parents returned Monday afternoon) it just seemed fitting. Don’t judge. I am the big sister. Not the parent. Meaning I can make fun calls like this one. Obviously, I have zero parenting skills, oops. Anyway, she pretended she was in the Harry Potter films and made pretend potions all while eating brownies and finger dipping through the whipped cream. And then it started to get dark, at like five freaking thirty, it literally looked like it was going to snow – SNOW! So we took a vote and decided, one – we needed hot chocolate, and two – it was time to switch to Christmas music and have a ten minute dance party. When the ten minutes were over we would then return to all things Halloween and pretend the Christmas thing never happened. So shh…it’s out little secret and can never be mentioned again. As far as Mondays go, I say that one gets a two thumbs up. But little sister is gone now, the house is quiet and I should probably start focusing my brain again. 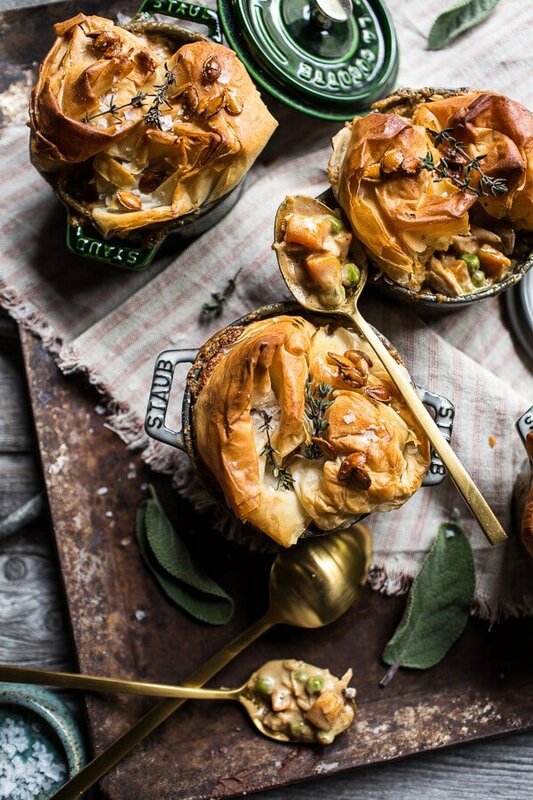 SO…can we talk about this phyllo dough crust situation?? It’s a GOOD situation, a really good situation. Don’t get me wrong, I love a good crust and I have an amazing pie crust recipe, BUT sometimes as far as chicken pot pies go, I find there can be just a little too much bread crust for my liking. It has to be the right crust and just the right amount of it. I am a pretty huge fan of phyllo dough, so naturally this little crust atop my pot pies was bound to happen sooner or later. It’s an easy way to make a homemade pot pie really shine… and well, the flaky layers just never, ever, fail…THE BEST. SIDE NOTE: last fall I made a Spanakopita Stuffed Spaghetti Squash and it was topped with phyllo dough. 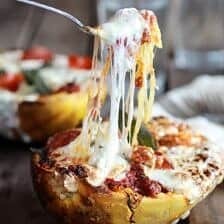 It too is a killer healthy fall dinner, you’ve got to try it! As far as the fillings go, I went with butternut squash, mushrooms, sage and thyme. I also added a little apple flavor by poaching my chicken in apple cider and butter. Yes. I went there. Chicken poached in apple cider and butter, it’s as perfect as it sounds…and SO moist. No dry chicken here. Also, my one little pet peeve about chicken pot pies are not to have a dry, no soupy filling. I love a creamy, extra saucy pot pie, so that’s what this recipe is. 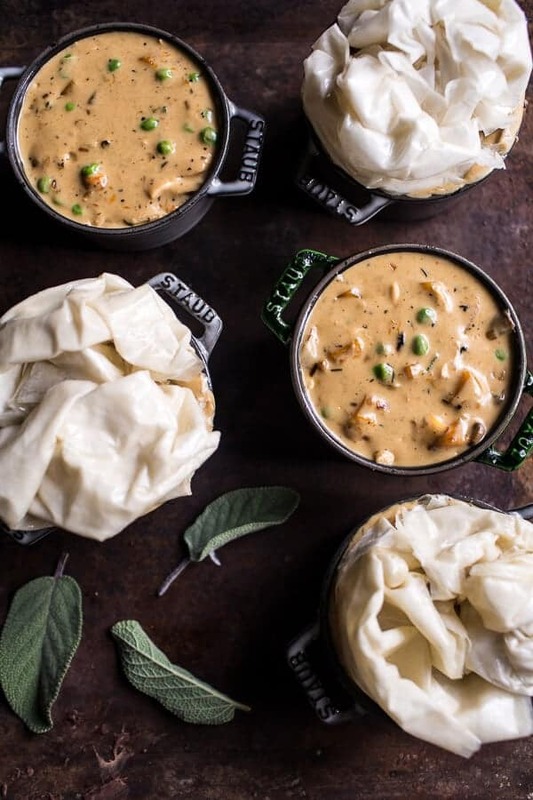 If you prefer pot pies to be a little more firmed up on the inside, I recommend reducing the amount of liquid in the sauce…but then not really, because I think the sauce is pretty amazing as is!! Double also, instead of the traditional chicken broth in the filling, I used apple cider. I loved the subtle sweetness it adds to the dish, but if you think you might not like this, just use chicken broth. No biggie! And finally, aren’t my little Mini Staub Cocottes so stinkin’ cute? I think I have them in all the colors. LOVE. Add the apple cider, butter and chicken to a large pot and set over high heat, covered. Bring to a boil and then reduce the heat to a simmer. Simmer 20 minutes or until the chicken is cooked through. Remove the chicken from the cider and allow to cool. Shred the chicken with two forks or your hands. Meanwhile, add the olive oil to a large skillet and set over medium heat. Once hot, add the onion and cook until softened and slightly caramelized, about 5 minutes, season with salt + pepper. Add the garlic, butternut squash and mushrooms. Continue to cook until the butternut squash is fork tender, about 10 minutes. Stir in the sage + thyme. To the skillet, add the remaining 6 tablespoons butter. Once the butter has melted add the flour and cook, stirring to incorporate for a minute. Slowly pour in the the chicken broth, milk and a pinch of cayenne. Bring the sauce to a low boil and then reduce the heat and stir in the peas. Simmer for 5 minutes or until the sauce has thickened. Remove from the heat. Stir in the shredded chicken. Taste and season with more salt + pepper if needed. Lightly grease 6 (8 ounce) ramekins with butter or cooking spray. Divide the chicken mixture evenly among the ramekins. Lay three pieces of phyllo dough flat on your counter. Liberally brush the top sheet with melted butter and squish the the sheets together to fit over top of your ramekin. Repeat with the remaining dough. 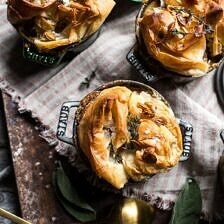 Place the pot pies on a baking sheet and bake for 30 minutes or until the phyllo dough is golden and the filling is hot. Serve with fresh thyme and toasted pumpkin/butternut squash seeds if desired. So now we eat, right?!? Yes. 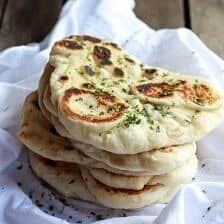 <–MAKE THESE. EAT THESE…have EXTRA happy stomachs. 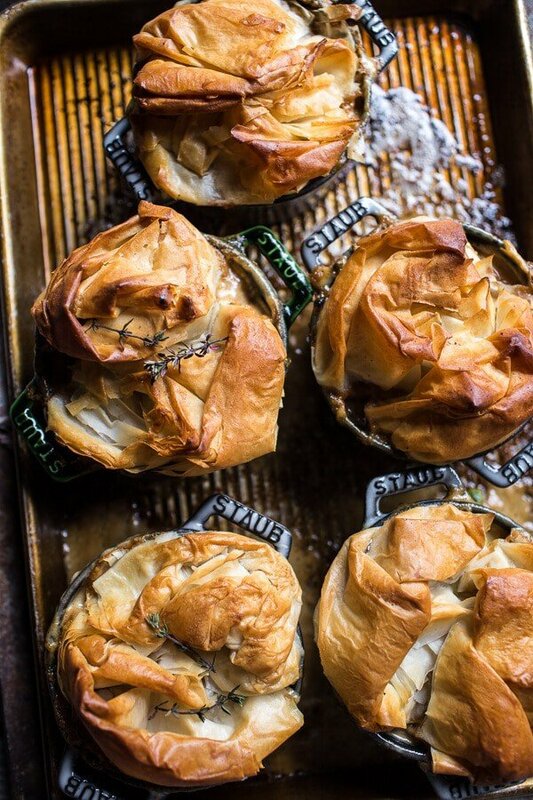 Wednesday + Autumn Chicken and Phyllo Dough Pot Pies = Complete. 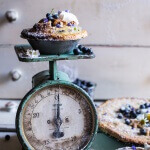 Sweet Blueberry Buttermilk Pies with Chamomile Cream. 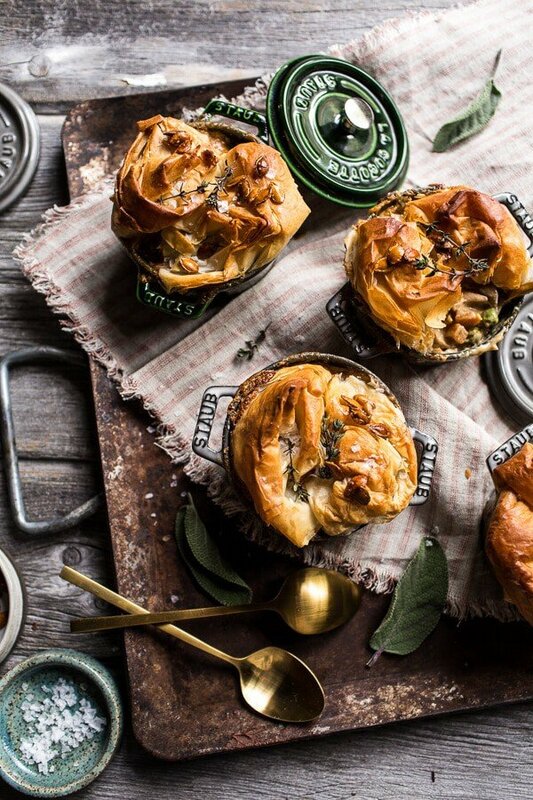 love that you use phyllo! much as i love cooking, it’s too much to do a fab filling + homemade crust. also- what a fun baking/sister day! i think it’s a perfectly acceptable excuse not to go to school (though i’m in the thick of school so anything besides it sounds great). Love your sister time! And love ( translate “envy”) your Staub and your photos! 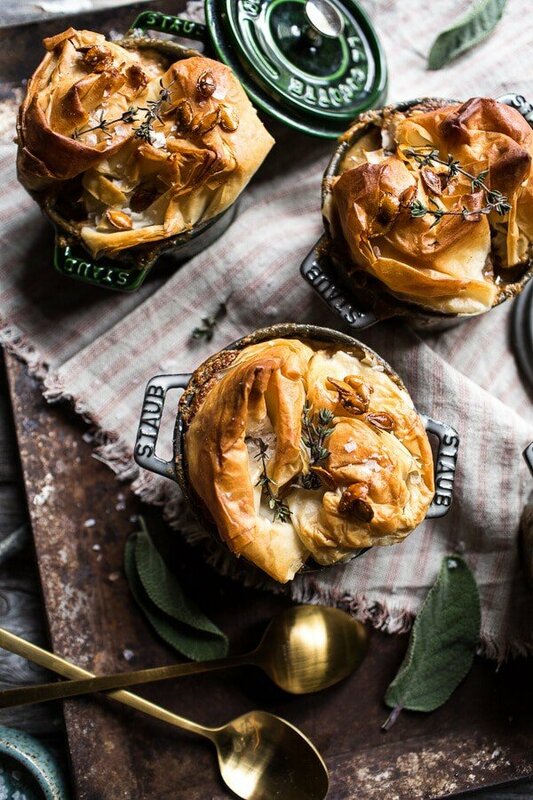 These pot pies sound amazing. Totally doing this for dinner tonight and sharing with shut in parents. Tieghan! These are beautiful! Apple cider instead of chicken broth! yum! I will be making these! 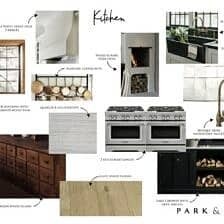 Love that you and Asher bond so often in the kitchen! Sounds like your an awesome big sister! Side note: I just realized you have an app! How cool. When did that happen? Or is this old news? Phyllo is the best, it just has that added crispy crunch, and is so perfect for pot pies :-). Love the filling and using the apple cider with the chicken sounds amazing. Sadly I can’t make these today, but as soon as I have a working oven, these will be the first to do. These look amazing! I love the concept of the phyllo dough as the topper for the pot pies. I love all of the fall flavors in here. I need to figure out a way to make this vegetarian friendly (possibly swapping out the chicken for beans). Oh, I must confess I have a huge problem with phyllo pastry – I do not like its taste!! Every time I ate something with that pastry it always felt like there was an aftertaste in my mouth that just didn’t agree with me, so I gave up on phyllo. But the filling for those pot pies, my my, that one’s a winner in my books!! These look so amazingly delicious! That filling is so cozy! I am totally imagining myself sitting by a fireplace and digging into these beauties! 1. Why not wrap the hole thing in the pastry, instead of just having it on top? Would it not cook properly? 2. In case we don’t have ramekins, what would you recommend? 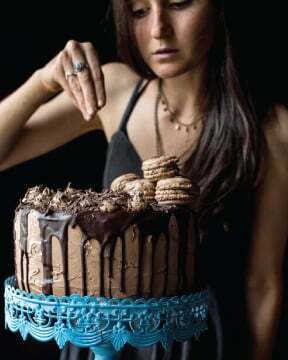 You can wrap the whole thing in pastry if you want. I just prefer a little less pastry with my pot pies. If you do not have ramekins just make one large pot pie in a pie plate or a pyrex pan. Hope that helps and let me know if you have any other questions. Hope you love the pie! 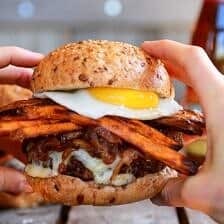 You are a food genius! 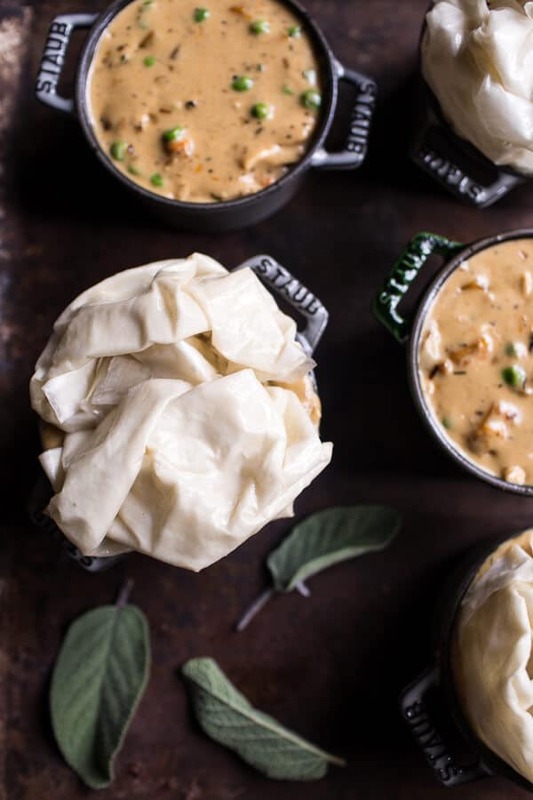 I love chicken pot pie and this one looks wonderful! I think it’s great the time you spend with Asher, those are the moments she’s going to remember the most so keep it up! 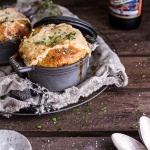 BEST looking pot pies ever!! Comfort food at its finest!! yas girl. letting little sissy skip school, yasss. harry potter potion pretending, yaaass. dancing for 10 min to Christmas music, yaaassss. making the most beautiful chicken pot pies, YAAAAASSSSS. This is such a stunning dish! I love how you bundled the phyllo on top instead of making a pie crust. That’s so creative! I’m in love with those golden spoons, too. Those are on my wishlist for sure! Those mini Staub’s are so cute!! I think i might have to add them to my Christmas list. 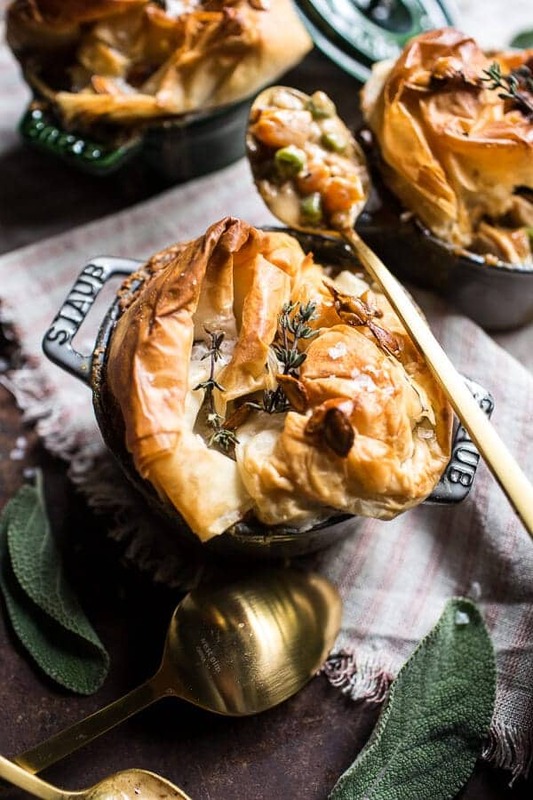 I’ve never been a fan of pot pie bc of the dough, so this is a great idea! Love it. 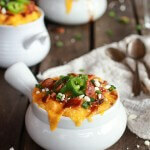 We are having unusual warm weather but I’m so in the mood for this recipe and soup. 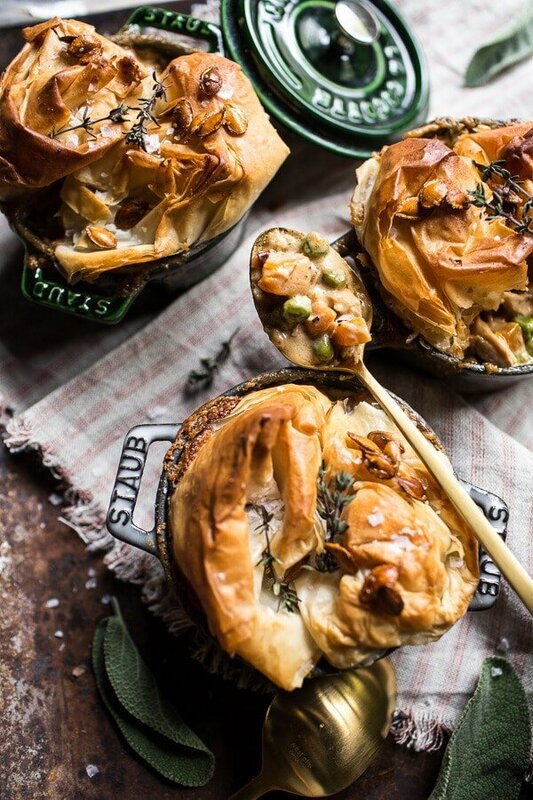 These pot pies are fall perfection, wish they were dinner tonight! Rookie mistake on my part sort of short changed my dinner tonight…frozen phylo dough needs 2 hours to thaw. Du! Oh, well…the filling was excellent and I used up some potatoes, because garlic mashed potatoes are not just for breakfast, right? My husband didn’t know about the improvisation. He just asked, ‘spoon or fork?” Gotta love him! These pot pies look so good, I hate to ask how fattening they are. On the other hand, don’t tell me lol! Just have to be a special fall dinner celebration! Those mini Staub pots are so adorable! These looks so yummy. Pot pies are the ultimate comfort food!! Looks like a master chef dish! Yummy! I made these and they were delicious. I’ll absolutely do them again. Thank you! So happy you loved them, thank you! I made this for dinner tonight and it was a hit. Absolutely delicious and accompanied with a glass of pinot noir. My Tuesday evening is complete. SO Happy you loved these!! THANKS! Great recipe! 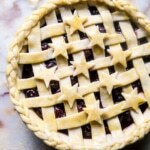 I make pot pies that are different but will try this version. We use coffee mugs instead of ramekins. That suits me fine to have a larger portion. You must go to the top so the filo dough can brown. It looks like I am late to the party. But, Mrs. OneLongTable wanted pot pies for her birthday. Of course, she got pot pies for her birthday. 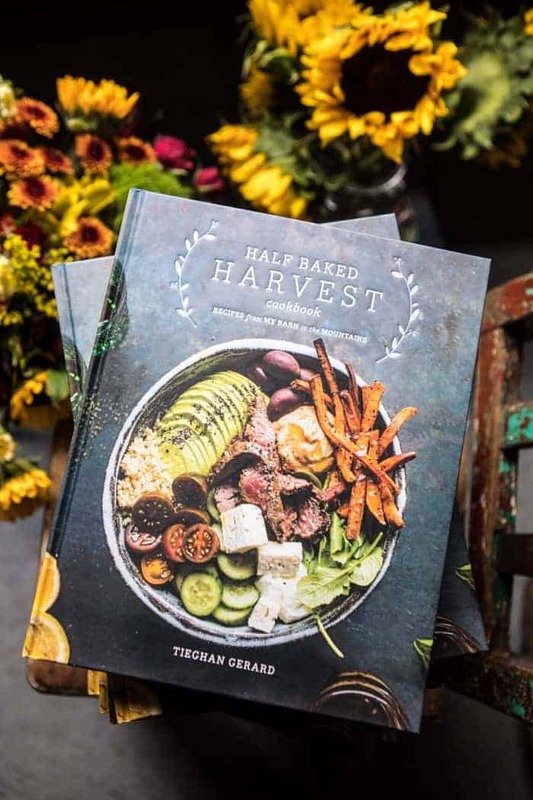 And, once again, halfbakedharvest was my go to recipe. Delicious. Ah yay how fun! SO happy you made mine (: Thank you. 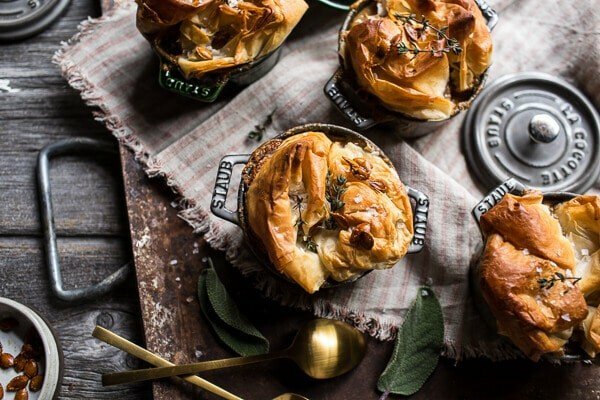 Question – would it work to make the pot pie filling and refrigerate it over night or whatever, and when ready to bake, pour into ramekin and top with Phyllo per instructions? Thank you!! Hi Andrea! I am so glad this turned out well for you! I will try to add in more directions for the phyllo!